The sales restriction does not seem to be the result of any particular regulatory actions or other outside forces; instead it appears to be a decision by the “new ownership and management” that was also announced at the same time. Wicked currently sells handheld lasers up to 2000 milliwatts (2 watts). In the U.S., lasers sold as “pointers” or for pointing purposes must be below 5 milliwatts output power; handheld battery-powered lasers over that power may still be sold legally if they are not “pointers” and if they meet FDA safety requirements for their laser class. All Wicked Lasers sold in 2015 will thus be within the U.S. “pointer” range of power. 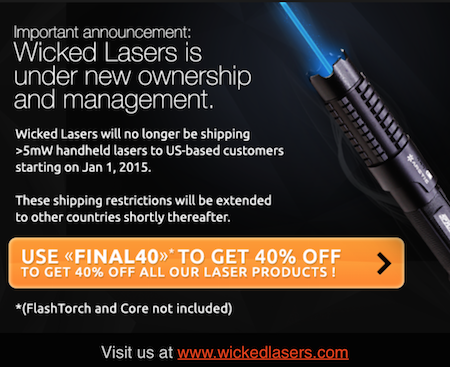 The announcement came with a 40% off sale, so the company will still be shipping high-powered lasers through December 31 2014. 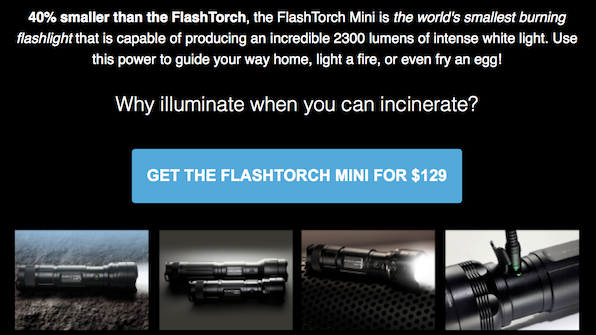 From the email announcement Wicked Lasers sent to customers on Nov. 19 2014 (shown above). Wicked Lasers has begun including the phrase “Don’t Aim Lasers @ Planes” in their two-line Google AdWords advertisements, starting in September 2014. Wicked is a major internet advertiser and a heavy user of AdWords. By doing this, the company puts the information in front of a large audience of persons whose browsing history indicates they are interested in lasers. The company’s intent is to help reduce the number of incidents of persons aiming lasers at aircraft. They are also one of the few companies to include a “don’t aim at aircraft” warning on their lasers’ labels, and in the user manual. A product report for the laser product has not been submitted. Products which can be Detained Without Physical Examination (DWPE) include laser pointers, laser gunsights, laser pens, laser light show projectors, laser special effects, laser levels, toy guns with lasers, laser pointer key chains, and similar products. Violating companies are listed as follows. Internet seller Wicked Lasers has introduced a nominal 1 watt green handheld laser for USD $1000. The company claims the laser’s beam has a power of 86 million lux, appears over 8,000 times brighter than looking directly at the sun, and can be seen at a distance of 85 miles (“beyond the atmosphere and into space”). Eye doctors are “shocked” that high-powered lasers are available on the Internet with no purchase restrictions. A U.K. physician says the U.S. limit should be 1 mW, that even at 5 mW laser pointers have “acute” dangers. FDA says that noncompliant (“illegal”) lasers are available despite agency seizures. Wicked Lasers says that its products are compliant, that they are “extremely clear” about eye and fire hazards on their webpages, and that they will be offering online safety lessons “before checkout”. A “large community” of laser enthusiasts wants to keep lasers available. An 18-year-old laser hobbyist, who wears goggles and is supervised by his parents, said he was learning about electronics, soldering, physics, light, optics and mechanics. From the New York Times, online on Feb. 28 2011, in print on March 1 2011 on page D5 of the National edition. Tech website Gizmodo reports that the FDA’s Center for Devices and Radiological Health (CDRH) sent a letter Nov. 3 2010 to Wicked Lasers, disapproving of “the quality control and testing program for all [Wicked] laser products.” This includes the well-known Spyder III Arctic, a nominal 1-watt, 445 nm blue handheld laser. Three of these items relate to a January 2006 letter which FDA says Wicked did not respond to. Four items relate to Wicked claiming in 2006 and 2008 that its lasers were sold for surveying, leveling and alignment (SLA) purposes; FDA says Wicked is not complying with restrictions on SLA lasers. (FDA has greater authority to regulate SLA lasers than it does to regulate general-purpose lasers). The final item objects to Wicked stating on its website that its products are “FDA Certified” when in fact the manufacturer certifies compliance to FDA, who reviews and files the certification documents. FDA gave Wicked 15 days to respond in one of three ways: by refuting the charges, by requesting an exemption, or by notifying purchasers and taking corrective actions (e.g., a recall or refund). 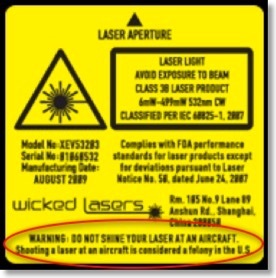 Wicked cannot certify lasers under the old “disapproved” testing program, and cannot import or sell non-compliant lasers or non-certified lasers. Casio has released the following warning statement about laser pointer type devices modified from their projectors. More on the lasers is here and here; more on the modification is here (look for the section on “sawed-off lasers and harvesting”). Emphasis in bold is added by LaserPointerSafety.com. Casio America, Inc. (“Casio”) has recently learned that potentially dangerous handheld laser pointer devices are being marketed and sold by Wicked Lasers, Ltd. (and possibly others) that are believed to incorporate laser diodes improperly removed from Casio XJ-A series projectors. Casio has never authorized this unintended and potentially dangerous misuse of the light source component of its XJ-A series Projectors. Casio specifically instructs and warns purchasers of its XJ-A series projectors that disassembly or modification of the built-in laser module is “very dangerous and should never be attempted,” and would like to take this opportunity to remind the laser enthusiast community of that fact. The unauthorized, unintended and potentially dangerous misuse of the laser diodes improperly removed from Casio XJ-A series projectors for use in these handheld lasers, such as Wicked Lasers’ SPYDER III, may create a substantial risk of fire and injury to users and others. Casio intends to pursue Wicked Lasers and any other companies that violate Casio’s rights by misusing components of its XJ-A projectors or other products to the fullest extent of the law. 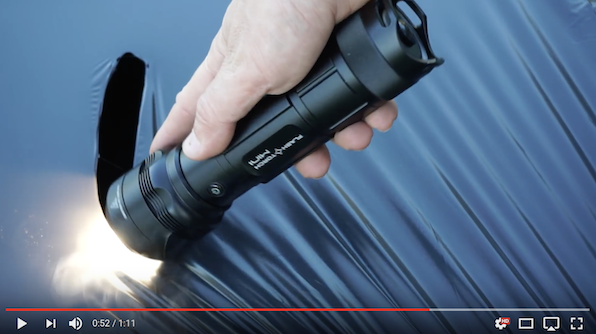 At the same time, Casio strongly urges consumers to avoid these unauthorized and potentially dangerous “laser pointers” such as the SPYDER III. Shooting a laser at an aircraft is considered a felony in the U.S. The new label is being introduced in September 2009 by Wicked Lasers. They have a significant presence on the Internet, marketing a wide range of lasers for pointing, burning/cutting, and general purpose uses.